In the winter of 2002, our Ojos Negros research group visited Arroyo El Barbon, in Baja California, Mexico. The task at hand was to locate and inspect several water wells in the vicinity. We hoped to use this information to learn more about the depth to the water table. 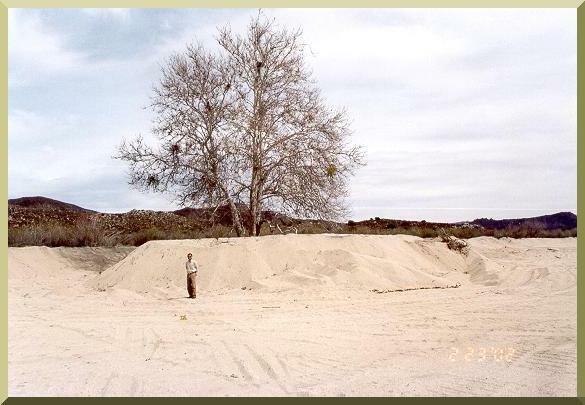 Evolving sand-mining regulations were requiring an operator to maintain an undisturbed, unsaturated layer of 4-m minimum thickness for the protection of the aquifer. As we approached one of the wells, we noticed something unusual. We soon realized that it was poorly maintained and that bees had established a hive on the well head. A junior member of our team suggested that we get rid of the bees and proceed to inspect the well. My response was quick and left no room for misunderstanding. I said: "Let's get the heck out of here." It is an extremely risky proposition to disturb a beehive, no matter how important the task. Closeup of sand-mining pit at Arroyo El Barbon, near Ojos Negros, Baja California, Mexico.